Once upon a time, I traveled all the time for work. I spent at least a week a month overseas, which would involve 3 hours to get to the airport, 3 hours in the airport, a 9 to 12 hour flight, and then a bunch of local hops by plane or train, plus the return journey. With that much time to fill, I got very good at sewing on the go! 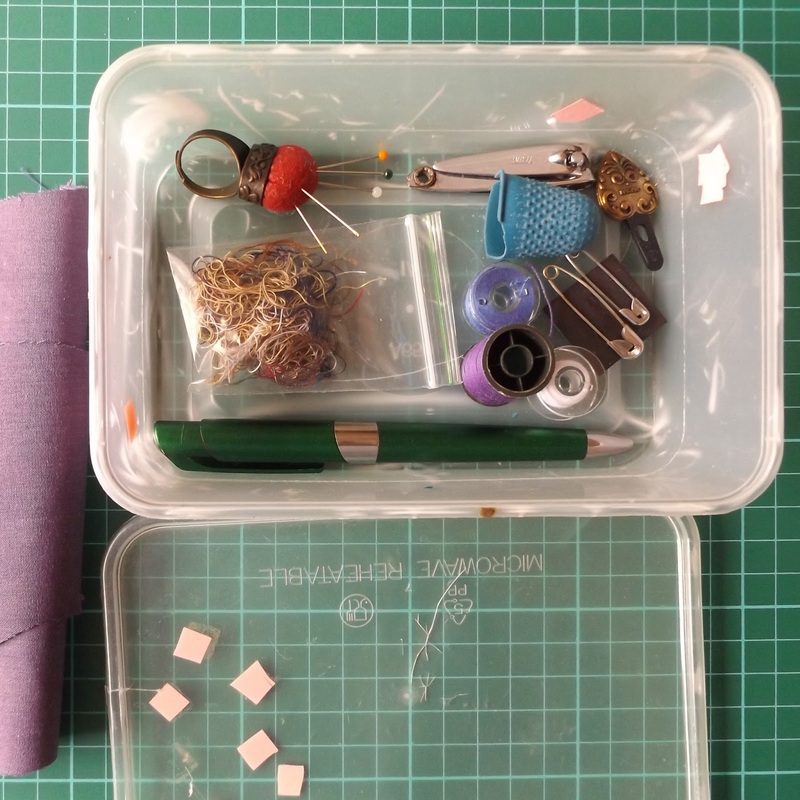 If you are planning a trip, whether by plane, train, or as a passenger in a car, consider putting together a sewing project for the road. This little box has come with me across the UK, US, Canada, the Caribbean, Ireland, Netherlands, Germany, Switzerland, Japan and S. Korea. I never have problems with security, even when pulled aside for a "random check". Plus, nothing in the box is particularly valuable, so losing anything would only be an inconvenience! a pincushion ring (don't use your pants or shirt for pins while flying, because you might forget them in there and ping at security). I also have a pincushion bracelet. 3 glass-head pins. I use two for swapping down the seam I am sewing, and a third as back-up or to pin further along the seam. 2 needles. I had a flight where my needly snapped mid-flight and I had to wait another 6 hours before I could sew again. Ever since then, I always travel with 2! For cutting string, I sometimes use little scissors if I'm on a train or car. However, when flying, I always use nail clippers with the file removed. You can also use the blade on a dental floss dispenser. Don't try the little round disk cutters, as the TSA considers them concealed blades! thread which has been wound onto a bobbin so that I can stay small. Also, when travelling with larger spools (or particularly cones) I am always searched at the gate, as security doesn't recognize what it is in the x-ray machine! bits of electrical tape (in this case, pink) to protect the nail on my left index finger from being scratched by my needle. I keep the bits on the outside lid of the box because I tend to forget to take the tape off when I put everything else away. a rubber finger cot for my right thumb. I use it to help grip the needle as I pull it through, rather than pushing the needle from behind like a proper thimble. Watch out if you try these sorts of finger cots - I bought some where the plastic disintigrated after about a year and got some strange goo on my fabric! The box itself is just a plastic food container. I like that it is rigid, but you can see that years of abuse have cracked the lid. I take only a bit of fabric in the kit. The rest goes in my luggage for another leg of the trip. It's also worth packing some fabric scissors. 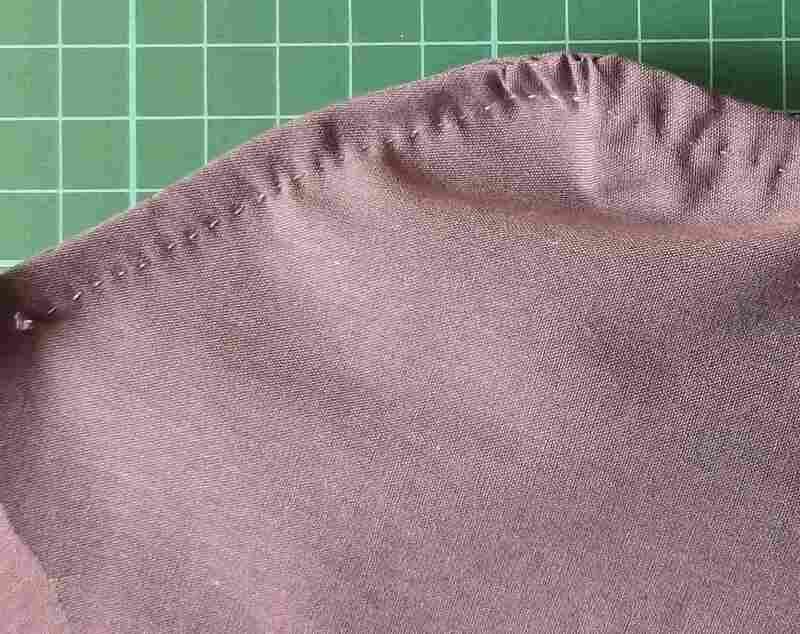 When sewing garments by hand, I use a running stitch and do French seams to finish the edges. I always clip balance marks into the seam allowance so that I can tune out and sew as I watch movies, listen to audiobooks, or generally tune out.